「外道の家・上巻」 "Gedo-no-ie (The house of the brutes) vol.1"
This is a first volume of a long story which was published serially in "Badi" magazine from 1999 to 2007. 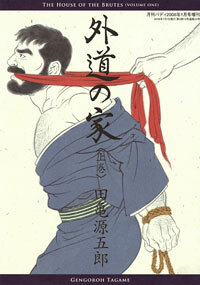 In 1949, Torazo, a muscular, bearish man, marries into the august Horikawa family in a country village. On his wedding night, he is raped by his new father-in-law, Souemon. His marriage is not a normal one: Torazo has been sold by his own family as a stud, and as such, is also destined to be the plaything his new father-in-law! Souemon is not the only person to humiliates Torazo. Souemon's mother, an eerie old lady, living in the attic, also has her way with Torazo's body. Torazo flees from his new family's house, but is caught and brought back by his very own brothers.